Professor Rami Abboud was awarded Honorary Professor of Orthopaedics from Maharashtra University of Health Sciences (MUHS) and the Sancheti Institute for Orthopaedics & Rehabilitation (SIOR) for his outstanding contribution to orthopaedics, collaboration and exceptional support of the students and staff of the Sancheti Institute over the last 14 years. The award was announced as a surprise at the Inauguration Ceremony on the 3rd February 2018 of the Combined Meeting of the 39th IASM & 9th Scientifica, which took place in the Sheraton Grand, Pune between 2-4 February 2018. 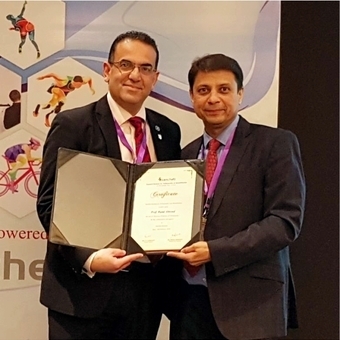 Professor Abboud was invited as Chief Faculty of the Indian Association of Sports Medicine (IASM) and one of three international keynote speakers. The award was presented by Dr Parag Sancheti (pictured top right with Professor Abboud) President of IASM, Chairman of Sancheti Institute for Orthopaedics & Rehabilitation, and Academic Council Member of MUHS. “For once I was left speechless, literally devoid of words, when the announcement was made by Parag but I am deeply honoured to receive this award, which coincides with the year that we will be celebrating the 25th anniversary of our MCh (Orth) course later in 2018. This award nicely compliments the Chancellor’s Award received in 2017 and the Honorary Fellowship from the Royal College of Surgeons of England in 2012, which all were received towards excellent contribution in teaching and the outstanding advancement of knowledge in Orthopaedics. For someone who is not surgically or medically qualified, I feel privileged to be perceived at this high level by my surgical peers both nationally and internationally”, stated Professor Abboud. Left: Professor Abboud presenting at IASM 2018; Right: L to R, Mr Sadiq Nasir, Professor Rami Abboud, Dr Parag Sancheti and Dr Graham Arnold at the University of Dundee trade stand at IASM 2018.